Want to be notified of new releases in sqshq/piggymetrics? This is a proof-of-concept application, which demonstrates Microservice Architecture Pattern using Spring Boot, Spring Cloud and Docker. With a pretty neat user interface, by the way. PiggyMetrics was decomposed into three core microservices. All of them are independently deployable applications, organized around certain business domains. Contains general user input logic and validation: incomes/expenses items, savings and account settings. Performs calculations on major statistics parameters and captures time series for each account. Datapoint contains values, normalized to base currency and time period. This data is used to track cash flow dynamics in account lifetime. Stores users contact information and notification settings (like remind and backup frequency). Scheduled worker collects required information from other services and sends e-mail messages to subscribed customers. Each microservice has its own database, so there is no way to bypass API and access persistance data directly. In this project, I use MongoDB as a primary database for each service. It might also make sense to have a polyglot persistence architecture (сhoose the type of db that is best suited to service requirements). 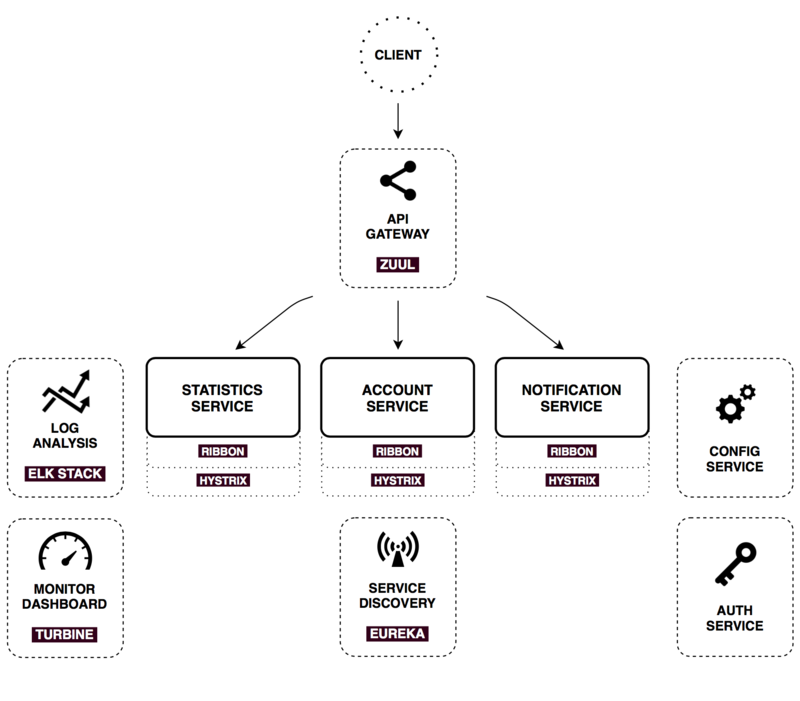 Service-to-service communication is quite simplified: microservices talking using only synchronous REST API. Common practice in a real-world systems is to use combination of interaction styles. For example, perform synchronous GET request to retrieve data and use asynchronous approach via Message broker for create/update operations in order to decouple services and buffer messages. However, this brings us to the eventual consistency world. There's a bunch of common patterns in distributed systems, which could help us to make described core services work. Spring cloud provides powerful tools that enhance Spring Boot applications behaviour to implement those patterns. I'll cover them briefly. Spring Cloud Config is horizontally scalable centralized configuration service for distributed systems. It uses a pluggable repository layer that currently supports local storage, Git, and Subversion. In this project, I use native profile, which simply loads config files from the local classpath. You can see shared directory in Config service resources. Now, when Notification-service requests its configuration, Config service responses with shared/notification-service.yml and shared/application.yml (which is shared between all client applications). Just build Spring Boot application with spring-cloud-starter-config dependency, autoconfiguration will do the rest. With Spring Cloud Config, you can change app configuration dynamically. For example, EmailService bean was annotated with @RefreshScope. That means, you can change e-mail text and subject without rebuild and restart Notification service application. fail-fast property means that Spring Boot application will fail startup immediately, if it cannot connect to the Config Service. Authorization responsibilities are completely extracted to separate server, which grants OAuth2 tokens for the backend resource services. Auth Server is used for user authorization as well as for secure machine-to-machine communication inside a perimeter. In this project, I use Password credentials grant type for users authorization (since it's used only by native PiggyMetrics UI) and Client Credentials grant for microservices authorization. Spring Cloud Security provides convenient annotations and autoconfiguration to make this really easy to implement from both server and client side. You can learn more about it in documentation and check configuration details in Auth Server code. From the client side, everything works exactly the same as with traditional session-based authorization. You can retrieve Principal object from request, check user's roles and other stuff with expression-based access control and @PreAuthorize annotation. 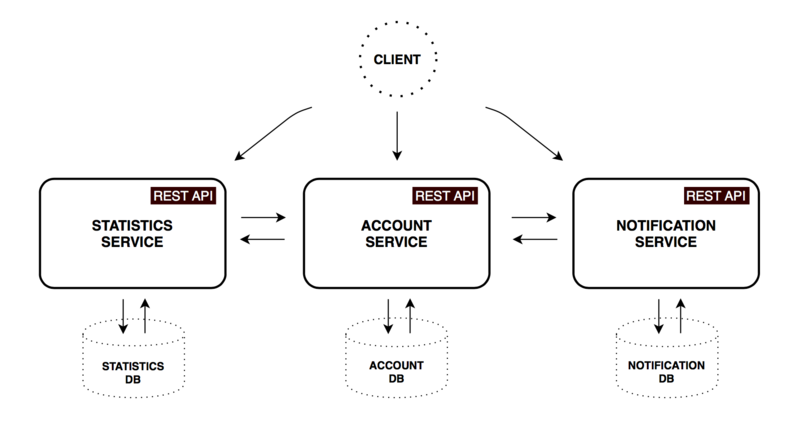 As you can see, there are three core services, which expose external API to client. In a real-world systems, this number can grow very quickly as well as whole system complexity. Actually, hundreds of services might be involved in rendering of one complex webpage. In theory, a client could make requests to each of the microservices directly. But obviously, there are challenges and limitations with this option, like necessity to know all endpoints addresses, perform http request for each piece of information separately, merge the result on a client side. Another problem is non web-friendly protocols which might be used on the backend. Usually a much better approach is to use API Gateway. It is a single entry point into the system, used to handle requests by routing them to the appropriate backend service or by invoking multiple backend services and aggregating the results. Also, it can be used for authentication, insights, stress and canary testing, service migration, static response handling, active traffic management. That means all requests starting with /notifications will be routed to Notification service. There is no hardcoded address, as you can see. Zuul uses Service discovery mechanism to locate Notification service instances and also Circuit Breaker and Load Balancer, described below. Another commonly known architecture pattern is Service discovery. It allows automatic detection of network locations for service instances, which could have dynamically assigned addresses because of auto-scaling, failures and upgrades. The key part of Service discovery is Registry. I use Netflix Eureka in this project. Eureka is a good example of the client-side discovery pattern, when client is responsible for determining locations of available service instances (using Registry server) and load balancing requests across them. With Spring Boot, you can easily build Eureka Registry with spring-cloud-starter-eureka-server dependency, @EnableEurekaServer annotation and simple configuration properties. Now, on application startup, it will register with Eureka Server and provide meta-data, such as host and port, health indicator URL, home page etc. Eureka receives heartbeat messages from each instance belonging to a service. If the heartbeat fails over a configurable timetable, the instance will be removed from the registry. Netflix OSS provides another great set of tools. Ribbon is a client side load balancer which gives you a lot of control over the behaviour of HTTP and TCP clients. Compared to a traditional load balancer, there is no need in additional hop for every over-the-wire invocation - you can contact desired service directly. Out of the box, it natively integrates with Spring Cloud and Service Discovery. Eureka Client provides a dynamic list of available servers so Ribbon could balance between them. Hystrix is the implementation of Circuit Breaker pattern, which gives a control over latency and failure from dependencies accessed over the network. The main idea is to stop cascading failures in a distributed environment with a large number of microservices. That helps to fail fast and recover as soon as possible - important aspects of fault-tolerant systems that self-heal. Besides circuit breaker control, with Hystrix you can add a fallback method that will be called to obtain a default value in case the main command fails. Moreover, Hystrix generates metrics on execution outcomes and latency for each command, that we can use to monitor system behavior. Feign is a declarative Http client, which seamlessly integrates with Ribbon and Hystrix. Actually, with one spring-cloud-starter-feign dependency and @EnableFeignClients annotation you have a full set of Load balancer, Circuit breaker and Http client with sensible ready-to-go default configuration. In this project configuration, each microservice with Hystrix on board pushes metrics to Turbine via Spring Cloud Bus (with AMQP broker). The Monitoring project is just a small Spring boot application with Turbine and Hystrix Dashboard. See below how to get it up and running. Let's see our system behavior under load: Account service calls Statistics service and it responses with a vary imitation delay. Response timeout threshold is set to 1 second. Well behaving system. The throughput is about 22 requests/second. Small number of active threads in Statistics service. The median service time is about 50 ms. The number of active threads is growing. We can see purple number of thread-pool rejections and therefore about 30-40% of errors, but circuit is still closed. Half-open state: the ratio of failed commands is more than 50%, the circuit breaker kicks in. After sleep window amount of time, the next request is let through. 100 percent of the requests fail. The circuit is now permanently open. Retry after sleep time won't close circuit again, because the single request is too slow. Centralized logging can be very useful when attempting to identify problems in a distributed environment. Elasticsearch, Logstash and Kibana stack lets you search and analyze your logs, utilization and network activity data with ease. Ready-to-go Docker configuration described in my other project. Analyzing problems in distributed systems can be difficult, for example, tracing requests that propagate from one microservice to another. It can be quite a challenge to try to find out how a request travels through the system, especially if you don't have any insight into the implementation of a microservice. Even when there is logging, it is hard to tell which action correlates to a single request. Spring Cloud Sleuth solves this problem by providing support for distributed tracing. It adds two types of IDs to the logging: traceId and spanId. The spanId represents a basic unit of work, for example sending an HTTP request. The traceId contains a set of spans forming a tree-like structure. For example, with a distributed big-data store, a trace might be formed by a PUT request. Using traceId and spanId for each operation we know when and where our application is as it processes a request, making reading our logs much easier. 2018-07-26 23:13:49.381  WARN [gateway,3216d0de1384bb4f,3216d0de1384bb4f,false] 2999 --- [nio-4000-exec-1] o.s.c.n.z.f.r.s.AbstractRibbonCommand    : The Hystrix timeout of 20000ms for the command account-service is set lower than the combination of the Ribbon read and connect timeout, 80000ms. An advanced security configuration is beyond the scope of this proof-of-concept project. For a more realistic simulation of a real system, consider to use https, JCE keystore to encrypt Microservices passwords and Config server properties content (see documentation for details). In this configuration, Travis CI builds tagged images for each successful git push. So, there are always latest image for each microservice on Docker Hub and older images, tagged with git commit hash. It's easy to deploy any of them and quickly rollback, if needed. How to run all the things? Keep in mind, that you are going to start 8 Spring Boot applications, 4 MongoDB instances and RabbitMq. Make sure you have 4 Gb RAM available on your machine. You can always run just vital services though: Gateway, Registry, Config, Auth Service and Account Service. docker-compose.dev.yml inherits docker-compose.yml with additional possibility to build images locally and expose all containers ports for convenient development. All Spring Boot applications require already running Config Server for startup. But we can start all containers simultaneously because of depends_on docker-compose option. Also, Service Discovery mechanism needs some time after all applications startup. Any service is not available for discovery by clients until the instance, the Eureka server and the client all have the same metadata in their local cache, so it could take 3 heartbeats. Default heartbeat period is 30 seconds. PiggyMetrics is open source, and would greatly appreciate your help. Feel free to suggest and implement improvements.